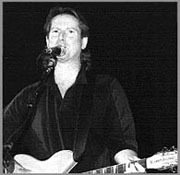 When most people think of the Rickenbacker 12-string, one person comes to mind...Roger McGuinn. Although the Beatles had the 12 string first, it was McGuinn who fully explored the possibilities of the instrument. The 12-string pictured at left is the model that George Harrison played in "A Hard Day's Night" (Roger plays a slightly different model). After seeing this movie, Roger decided to switch to the Rickenbacker 12-string. As the driving force behind the Byrds, McGuinn was easily one of the most influential artist of the 60's. Roger's influence can be heard today in bands like Tom Petty and the Heartbreakers. There is even a band from Florida called the Lears, which plays their originals in an amazing Byrds-like style. In this interview I tried to avoid most of the Byrds history questions, since these are well documented. E.C. : First, being a guitar player myself (and also playing a rickenbacker 12 string in my band! ), I had a few questions about your guitar playing.Your work on the 12 string seems much more innovative than the Beatles. It was like nothing that had been heard up to that point. I know thatyou had a folk background, but how did you come to that style of playing? How long had you played a 12 string? Roger: I found a Stella spruce top 12-string in Chicago around 1957 and learned to play it. Lead Belly Bob Gibson, and Pete Seeger were myinspiration. At the same time I began playing 5-string banjo. Somehow I combined the two picking styles on the 12-string.That's what makes my style sound different; it's a 5-string technique, incorporated with standard guitar finger picking. E.C. : I know that some of the earliest Byrds work was with the 12 string acoustic guitar. Did the influence of the 12 string come before orafter "A Hard Day's Night"? Or was that just when the Byrds decided to go electric on the 12 string? Roger: Right, I'd had my acoustic 12-string for years. The Beatles movie showed me that there was a great electric 12-string on the market. Roger: Yes, that story is true. George gave Derek Taylor a copy and asked him to hand deliver it to us, before the release of the song, along withthe explanation that he had put it together with the riff from the "Bells of Rhymney." E.C. : As for harmonies, three groups come to mind when you think of the 60's: the Beach Boys, the Beatles and the Byrds. Brian Wilson was influencedby the Four Freshmen and the Beatles by the Everly Brothers. What was the Byrds harmony influence, how did it come about? Roger: David Crosby was out harmony man. His influences were the same as the Beatles, with a little jazz thrown in the mix. E.C. : "Sweetheart of the Rodeo" was originally intended to be a 2 record set, with the intention of covering the change from country to jazz/rock.If the album had been completed as intended, do you think the history of the Byrds would have been different? Roger: Very different, but I can't say that the "Musical History" album would have done as well in the long run. E.C. : Speaking of which, Chris Hillman had a country hit in 1989 with his version of "You Ain't Going Nowhere"(and I saw you do a fantastic liveversion in 1991 in Austin), which pretty much kept the Byrds 1968 arrangement. So, you can say that the Byrds are even influential intoday's country music. What was it like to play the Grand Old Opry in 1968? What was the reaction of the audience? At least you got ahilarious send-up song out of it ("Drug Store Truck Driving Man")! Roger: It was a great thrill to play the Grand Old Opry, especially for Gram. There is still some residual influence from what the Byrds did outthere. E.C. : I'd like to ask about one of your unfinished concepts, Gene Tryp. The Who only recently got to present "Quadrophrenia" to their satisfactionin 1997. It also took them several years to get the idea into a movie. Also, Townsend has talked about resurrecting the futuristic"Lifehouse" project from 1970. Have you ever thought of continuing Gene Tryp? Roger: We did a presentation of "Tryp" at Colgate University a few years ago. It was great fun! E.C. : I was blown away by the "Never Before" album when it came out. Why didn't the Byrds release, "It's All Over Now Baby Blue"? It seems likeit would have made the perfect follow up. Was the band dissatisfied with the take, or was it a management decision? Roger: So many things were going on at that point, it's hard to say. E.C. : The Beatles and the Stones would often guest on each others albums, albeit low key. Once the Byrds had become famous, did you get a chanceto guest on any sessions for other groups? Roger: Roger: Yes, Crosby can be heard on "Sgt. Pepper." E.C. : I had read that you are a born-again Christian. I know Dylan had his born-again phase in the 70's. Are you still a born-again Christian? Iknow that several born-again artists get pigeon holed and it severely limits their lyrical content. Do you think that it has any effect onsongwriting? Roger: Yes I'm still a believer, but don't do "Christian" music, I'm a folk singer. E.C. : When first listening to the Beach Boys album, "the Beach Boys Love You", I was surprised to see your name on the songwriting credits for"Ding Dang". How did that come about? Have you worked with Brian any other times? Roger: That was the only song that Brian and I wrote together. He came to my home in Malibu and we jammed all night. E.C. : I know that you have never worked with Dylan on an album. But, I think it would be a natural for you to play on a Traveling Wilbury's record!You have Dylan AND Tom Petty there. Would something like this ever be a possibility? Roger: That's hard to say. I haven't been asked to join them. E.C. : I recently saw the Byrds on VH1's "Monterrey Pop-the Lost Performances". The current trend seems to be releasing these lost, yetstunning live sets from the 60's, whether it be Dylan, Hendrix or the Jefferson Airplane. The only official live Byrds release was 1/2 of the(Untitled) record in 1970. Are there any live Byrds performances "in the can" that have the possibility of being released? Roger: Yes there's one coming out this summer, "The Byrds Live at the Fillmore." E.C. : A few years ago a band that billed itself as "the Byrds" played a small gig in the Atlanta area. The group consisted of later-Byrds members. Iknow that before his death, Michael Clarke was playing in a band billed as "the Byrds". What are your feelings about a group performing as theByrds with NO original members? Roger: I'm upset that such a group is going out and ripping off the public like that. E.C. : Lennon used to complain that you only heard the same 5 or so Beatle songs on the radio, despite their vast influence. It seems that only aselect few Byrds songs get heavy rotation on the radio. The oldies stations play only "Mr. Tambourine Man" and "Turn, Turn, Turn", whilethe classic rock stations play "Eight Miles High". What do you feel are the strongest Byrds songs? What songs would you like to hearplayed more? Roger: "She Don't Care About Time" and "Renaissance Faire" come to mind. E.C. : Finally, do you have any plans for new studio recordings? I loved "Back From Rio" (and the 91 tour!). Roger: Yes, I'll do a rock CD at some point.